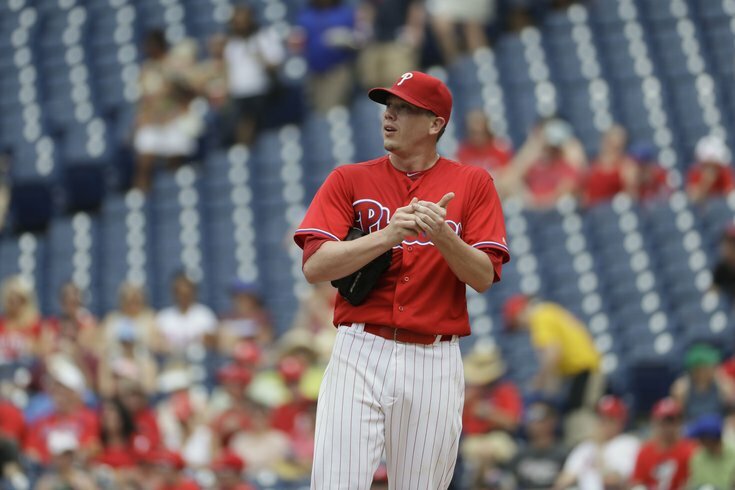 Jeremy Hellickson better have his bags packed because the Phillies are headed for a 10-game road trip and he's unlikely to return with the team when they play at Citizens Bank Park again after the trade deadline. Jeremy Hellickson picked an opportune time for his best start of the 2016 season: he held the Miami Marlins to one run in eight innings, striking out eight and walking no one, in the Phillies' 4-1 win on Wednesday night. In case you hadn’t heard, Major League Baseball’s trade deadline arrives in 11 days. Hellickson is the most obvious of Phillies trade chips: he’s a free agent at the end of the year, Jake Thompson is more than ready for a promotion from Triple-A, and, in a seller’s market, the front office should do pretty well in landing a useful prospect (or two) from one of many contending teams looking for starting pitching. Hellickson has a 3.84 in 20 starts (and a 3.00 ERA in his last seven). Those are better numbers than Joe Blanton had (4.96 ERA in 20 starts) before switching uniforms from the Oakland Athletics to the Philadelphia Phillies eight years ago this month, and, well, we know that move worked out fairly well for the buyer. The Baltimore Orioles and Miami Marlins have been reported by various outlets as potential suitors for Hellickson. Phillies general manager Matt Klentak took a break from keeping up with his incoming phone calls to talk about the trade market on Thursday, prior to the Phillies final home game before the August 1 deadline. “I’ll tell you what, it’s been very active the last few days,” Klentak said. “I think once we got within two weeks of the deadline, industry-wide, it’s really picked up a lot. There has been a lot of dialogue. “Truth be told, a lot of those conversations go nowhere. None of them have led to anything. Some are fairly superficial. Some are fairly detailed. We’ll just continue to take the calls and see what may happen. The rebuilding Phillies have an obvious motivation to see what the market is for someone like Hellickson, who doesn’t really fit into their plans for 2017 since he’ll be a free agent seeking a multi-year deal and they have a pretty strong stable of young starters (and can always revisit the market for a bargain veteran on a one-year deal, as they did in trades for Hellickson and Charlie Morton last winter, in the upcoming offseason). With the aforementioned Thompson dominating in Allentown over the last month, Hellickson’s exit creates opportunity. Similarly, the Phillies could look to trade one of their outfielders (Peter Bourjos, another soon-to-be free agent, makes the most) to create a spot for Aaron Altherr, who had his minor league rehab assignment moved to Double-A Reading on Thursday, or for rising outfield prospect Nick Williams. With all that said, Klentak doesn’t feel pressured into making deals just for the sake of making them or to create spots for those other players on the cusp of the big league roster. “I don’t feel like we have to (make trades), which is good, because sometimes when you feel compelled to make a trade, that’s when you make a bad trade,” the first-year GM said. “We don’t feel the pressure to make one just to make one. But I will say that it helps when we have players in the minor leagues, or in Altherr’s case, coming off the DL, when you have players who are putting themselves in position to be able to contribute and potentially back-fill an opening, that gives me more confidence as I enter the trade market. Although it’s difficult to argue the benefits of keeping a player like Hellickson around for the season’s final two months, he doesn’t represent the only veteran in the Phillies starting staff. If he were traded, Jerad Eickhoff (who turned 26 this month) would be the oldest pitcher in the rotation. Klentak and his coaching staff obviously value the presence of a guy like Hellickson and its effect on a young and impressionable staff. While Klentak has a point, that’s also pretty good GM-speak (read: posturing) on July 21. It would be more than a mild shock if Hellickson remains on the roster when the Phillies return from their upcoming road trip on August 2. In addition to Hellickson and Bourjos, veteran relievers Jeanmar Gomez and David Hernandez are candidates to be dealt before the deadline, as is veteran catcher and 2008 World Series alum Carlos Ruiz. Of course, Klentak made one of those kinds of trades this winter, however, when he shipped pre-arbitration closer Ken Giles to the Houston Astros for five pitchers, including Vince Velasquez. But it doesn’t sound like Klentak is ready to make any similar kinds of trades, with, say, Odubel Herrera or Hector Neris or whatever other young-and-under team control player that could have serious trade value this month.